General Daily Predictions: Today, the Moon from Aquarius forms a hexagon with the Sun in Sagittarius and a square with Jupiter in Scorpio. So, this is going to be a mostly bright day. Not as lucky and bright as it would be if Jupiter wasn’t stressed, but nevertheless, a good day. Sagittarius and Aquarius will be the luckiest zodiacs of the day. Pisces, Gemini and Virgo will be the ones facing the most stress. International transactions and trade are very blessed for you, today. Studies of all kinds, too. Even more so for subjects of technological and philosophical nature. Seeking new friends, lovers, or sexual partners online, as well as in parties and the like, may bring you a lot of potential such people, but not necessarily of a good quality. There is some good luck regarding your work. Especially the way you feel about it. A new, more desirable job or post, or something similar is possible. Legal issues may be a little demanding, but not really much of a problem. You may need to spend most of the time of this day in unpleasant things. Work can be very demanding, home may need much more care than you are willing to offer, things like those. They won’t be really bad, but they won’t be pleasant. Love life still receives happy vibes. Some pleasant developments are most likely to happen, regarding your job. If you are seeking for one, this is a good day to find one, too. Love life seems peculiar. Unlucky situations, or unpleasant discussions may take place, but the end result will be, most probably, a good and happy one. This is a mostly pleasant day for you. Love life receives most of the blessings. This is true both for those in a relationship and for those seeking one. Financials receive some luck too. Family can be stressful, or bothersome in one way or another. Co-workers seem to find it difficult to understand you. It can also happen the other way around. But, actually, work is advancing today in a good way. Setting the foundations of a better future is also possible. This is a mostly good and happy day for you. 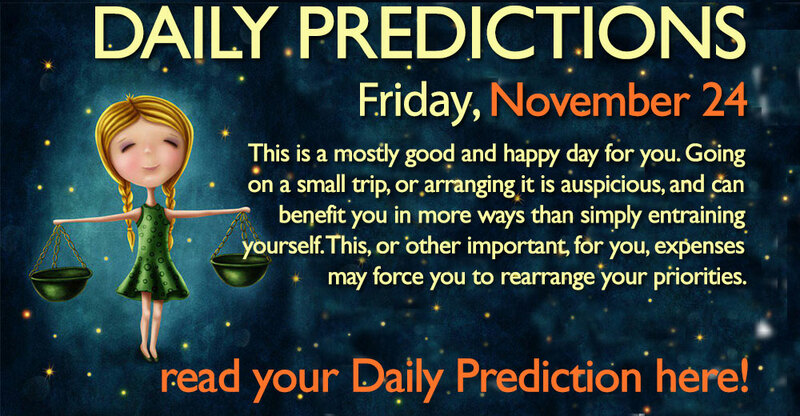 Going on a small trip, or arranging it is auspicious, and can benefit you in more ways than simply entraining yourself. This, or other important, for you, expenses may force you to rearrange your priorities. Home takes most of your time today. Tidying up, or otherwise taking care of it is what you are doing, and want to be doing. Your mood may be lacking a little, but just a little. So, keeping yourself busy is probably a good thing. This is probably only beneficial day for you. Things are falling into the right place with a relatively small effort of yours. Sometimes you tend to overindulge in negative thoughts, but not in a destructive, or distracting way. Money matters seem important today. Luck and clever thinking are helping you with those. Nevertheless, some expenses may appear. Mostly in the form of acquiring desirable equipment, or making an investment of some kind. This is a very good day for you. Most, if not all, things proceed nicely. Career matters may need some extra care and effort, but nothing that you cannot manage. The way you feel about what’s going on in your life and say is more eventful than what actually happens. This is not necessarily a bad thing, though. Make sure you experience the pleasant things and situations to their fullest, but don’t follow the same rule for the unpleasant ones. Good luck and wish manifestation magic are very strong and capable today. Moon 18° Scorpio 51' 26"
Mercury 04° Aries 37' 22"
Venus 00° Aries 13' 20"
Previous Story Previous post: Does Religion Destroy Spirituality?